One of only four island groups to have World Heritage listing, Lord Howe Island is part of New South Wales and lies some 700 kilometres northeast of Sydney and the same distance southeast of Brisbane. The island is the remains of a volcanic eruption that occurred around seven million years ago. Just 11 kilometres long and three kilometres at its widest point, two thirds of the island’s land mass is covered in rainforest and bushland. It is also home to the southernmost coral reef in the world. Lord Howe Island was discovered in 1788 by the First Fleet ship HMS ‘Supply’ under the command of Lieutenant Henry Lidgbird Ball. He was on a journey to Norfolk Island looking for sources of food and water for the infant Sydney colony. He claimed the island as a British possession, naming it after the then Lord of the Admiralty, Lord Howe. Settlement began in 1834 with the island supplying passing ships with food and water. Just 350 residents live on Lord Howe and visitor numbers are restricted to 400 at any one time due to the island’s World Heritage status. The main industries are tourism and the propagation of Kentia Palms, now available throughout the world. The protection of Lord Howe’s unique environment is a source of pride for both the community and the visitor. The forests include banyan trees, pandanus, the indigenous Kentia palms and a huge variety of flora. The surrounding waters are now a marine park and are home to some 94 species of coral and 490 fish species. For bird lovers, there are over 130 species of permanent and migratory birds, including the once endangered Lord Howe Island Woodhen. There are no snakes, stinging plants or sandflies. You can explore Lord Howe easily on foot with a ‘Discovery Kit of Walks’ available at the Island Visitor Centre. An eight hour, rope-assisted guided walk up Mt. Gower is very popular. The museum on Lagoon Road provides a focal point for information and a fascinating look at the history of the island. All accommodation properties provide free airport transfers and a network of walking tracks criss-cross the island. These vary from very easy to quite difficult and all have well marked signposts. Maps and trail guides are available for purchase. Hiring bicycles is the best way to see the island and there are also a limited number of hire cars available. 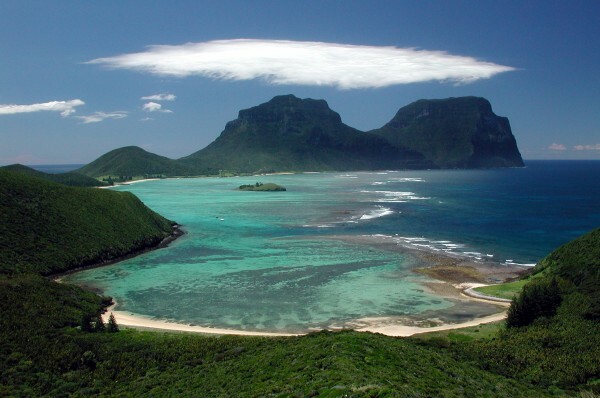 Lord Howe offers deep-sea and rock fishing, bush trekking, and mountain climbing. There are also guided nature walks with local experts and tours of the kentia palm nursery. There is fish feeding every day at Ned’s Beach, reef walks, scuba diving, kayaking or snorkelling. Other options include bus tours round the island or glass-bottom boat tours of the lagoon and reef. This piece first appeared in Pacific Island Paradises Magazine.